This week, the Indiana Senate Republican caucus unveiled our $34.6 billion budget proposal to fund state government for the next two years. Most importantly, the Senate Republican budget plan is balanced and maintains healthy “rainy day” reserves. 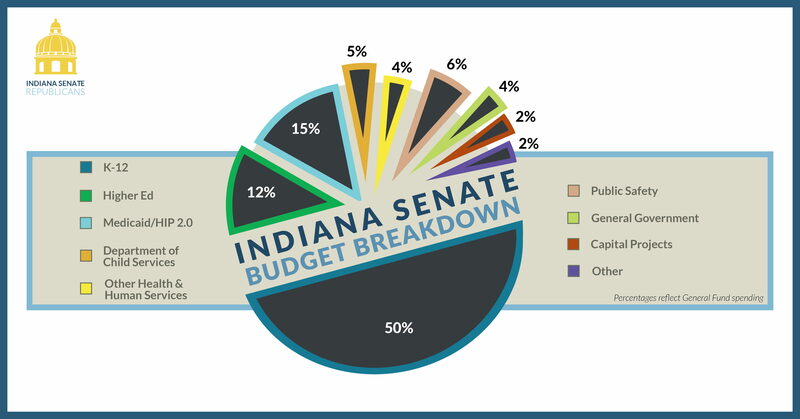 As highlighted in the chart above, the Senate Republican budget also continues Indiana’s track record of putting K-12 education first by devoting over half of General Fund spending to our schools. Total funding for K-12 education would reach over $17 billion – a $775 million increase over the current state budget. Increasing funding for Teacher Appreciation Grants (TAGs), which are cash stipends that go directly to teachers, to $90 million – a $30 million increase over the last state budget. The Senate budget would specifically support new teachers by directing schools to use at least one-third of their TAGs for teachers with less than five years of experience. Fully funding the Department of Child Services (DCS) budget request, and requiring DCS to increase payments to families who adopt foster children. Continuing the fight against the drug abuse by increasing funds for addiction treatment, including low-level criminal offenders, and funding a new State Police drug-testing lab that will help law enforcement better investigate drug crimes. Providing $75 million to support the expansion of broadband internet access in rural communities. Providing over $52 million to workforce development training programs and initiatives, including Gov. Holcomb’s Next Level Jobs Employer Training Grant and Workforce Ready Grant. Providing $20 million in grants, loans and other financial assistance to aid water infrastructure development and improvements. The proposed budget would also fully fund the Medicaid forecast as well as provide money to Indiana State Police to prevent internet crimes against children. These and other measures in the proposed budget will help provide for our state’s needs and ensure we live within our means by maintaining Indiana’s strong reserves. For more information on the Senate Republican budget proposal, click here.